Background: Two enantiomers of a drug which might have various pharmacological, physiological, and toxicological properties are well-known. Enantioseparation of chiral drugs is becoming significant in various fields. Objective: The aim was to obtain better detection sensitivity and good enantioresolution of Norepinephrine (NE), Epinephrine (EP) and Isoproterenol (ISO)at the same time. Method: A new and sensitive method for NE, EP and ISO was developed by Capillary Electrophoresis- Indirect Electrochemilumine-Scence (CE-IECL) based on their quenching effects on the Ru(bpy)3 2+/tripropylamine (Ru(bpy)3 2+/TPA) system, using negatively charged carboxymethyl-betacyclodextrin( CM-β-CD) as chiral selectors. 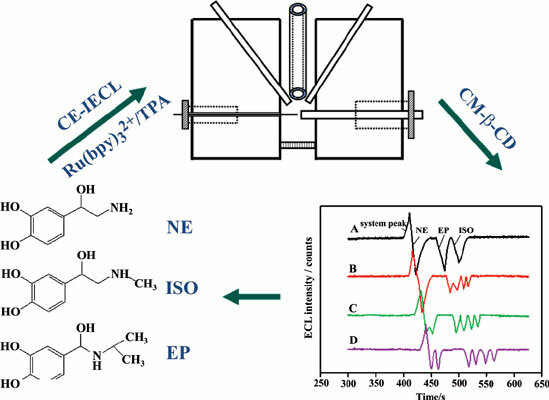 Results: The enantiomers of NE, EP and ISO were characterized with baseline enantioseparation and highly sensitive detection. Conclusion: A wide and excellent linear relationship of each enantiomer was observed in the range of 0.10 to 1000 µM with detection limit (S/N=3) ranging from 0.03 to 0.10 µM, with the RSD of peak area and peak height from 3.1-3.5% and 2.9-3.4%, respectively. This CE-IECL method was successfully applied for the enantioseparation of NE, EP and ISO in serum sample; the recoveries of NE, EP and ISO in serum ranged from 95.0% to 104.0% with relative standard deviations less than 3.4%. Capillary electrophoresis-indirect electrochemiluminescence, Enantioseparation, norepinephrine, epinephrine, isoproterenol, chiral drugs.